Uhuru Corporation (“Uhuru”) announced today an agreement with NEC Corporation (“NEC”) to enter into an alliance for business in the IoT realm. The two companies will conduct joint development of an integrated service combining NEC’s IoT platform “NEC the WISE IoT Platform *１” and Uhuru’s IoT Orchestration Service “enebular®” to support companies in operating and managing IoT devices properly and in utilizing data obtained from the devices. Uhuru and NEC will also engage in sales promotion activities and provide support for clients in generating new business utilizing the service. The new version of “enebular”, containing results from this collaborative effort, will be released in January 2019. 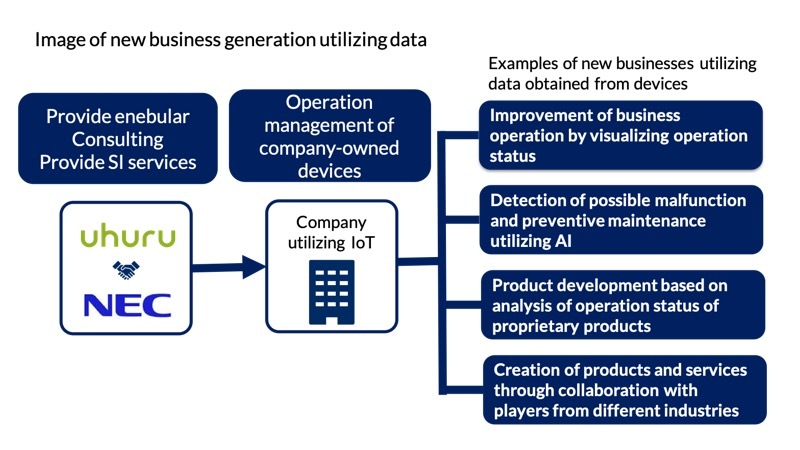 To streamline business operation, save energy consumption, reduce manpower and reduce costs by utilizing data obtained from devices that are being used, more companies are engaging in efforts to use their devices for IoT. While IoT allows data utilization through collection and visualization of data or advanced and diversified analysis by AI, risk of becoming the target of cyber-attacks arises. Features that protect IoT devices and data from such threats and enable secure operation and management are becoming increasingly essential. Given the trend, Uhuru provides “enebular”, a development and operation service that supports creation of IoT products and services. “enebular” enables easy utilization of customer data through development of applications and solutions and seamless system integration. NEC provides IoT security products, including IoT Device Security Manager *３, Lightweight cipher software development kit *４ and SecureWare/Credential Lifecycle Manager *５, ensuring high-level security indispensable for IoT systems. The alliance combines strengths of the two companies to achieve secure management and operation of IoT devices and development/implementation of IoT applications speedily and safely. In addition, by utilizing “enebular” on “NEC the WISE IoT Platform”, which allows efficient data collection and use of cutting-edge AI technology, an operation environment that integrates the edge and the cloud will be provided, helping clients generate new value through management and utilization of data obtained from devices. Based on this alliance, Uhuru and NEC aim to deliver new value to existing clients and to enforce cultivation of new clients. The targeted revenue in the two years from 2019 to 2020 is JPY 2 billion. Joint development of “enebular” involves embedding NEC’s software delivery feature into enebular’s functionality to deliver software to and manage IoT devices equipped with Arm® Mbed™ OS *６ (“Arm device(s)”) to achieve highly efficient software delivery. By utilizing “enebular” on “NEC the WISE IoT Platform”, the service can be used to operate Arm devices and by collecting and accumulating obtained sensor data on “NEC the WISE IoT Platform”, various kinds of analysis can be done in collaboration with “NEC the WISE *７”. For example, by analyzing various sensor data collected by Arm devices embedded in smart home appliances, signs of possible malfunction can be detected. Services for utilizing IoT devices and data obtained from the clients’ IoT devices and for ensuring secure management from development to disposition of devices will also be provided by combining “enebular” with NEC’s IoT security technology. The two companies will take advantage of their sales channels to support sales promotion of IoT solutions utilizing “enebular” and the clients’ efforts to generate new business. Uhuru and NEC will help clients, mainly private corporations in manufacturing and distribution, streamline product development and device operation management, as well as generate new business by utilizing data obtained from products and devices. *２ “enebular” : Development and operation service provided by Uhuru which helps clients create IoT products and services. In combination with NEC’s IoT platform, data obtained through applications developed with “enebular” can be analyzed by NEC’s AI technology. *３ “IoT Device Security Manager”: Whitelist-based access control software that protects customers’ systems from various threats that occur on the edge and devices in IoT. *４ ”Lightweight cipher software development kit”: Software libraries for various platforms using NEC’s proprietary lightweight cipher TWINE and authenticated encryption OTR with the world’s top-class performance on their implementation. *６ “Arm® Mbed™ OS”: Embedded OS developed and distributed as open source software for IoT devices by Arm Ltd. The offered connectivity and security platform allow IoT application developers to build prototypes and put the product to actual use in a secure environment easily and in a short period. *7 “NEC the WISE” is the brand name for NEC’s lineup of cutting-edge AI technologies. Uhuru provides products and services centering on IoT business under the corporate philosophy of “using technology and free thinking to create the future”. enebular, Uhuru’s proprietary product for IoT Orchestration Service allows integrated development and management of the edge and the cloud. We are also working on new kinds of next-generation telecommunication technologies such as NB-IoT to meet the requirement of the 5G era. Our team consists of experts in various fields including consulting, engineering and creatives. We offer one-stop professional service from business strategy, technological support, to communication strategy necessary for implementing IoT business and aim to create new values for the customers and to contribute to bringing about a prosperous future.